The Prime 18XS is intended for use as a high-output bass driver in multi way systems and features a 4 inch 'sandwich' (inside and outside windings) voice coil, immersed in a symmetric magnetic field yielding increased linearity and lower distortion. This, coupled with laminated silicone suspensions, a large Xmax of 12mm with peak to peak travel of 60mm, ensures fast accurate bass at high levels of excursion. The cone membrane, manufactured from polycellulose, is much stronger and more durable than conventional paper pulp alternatives. 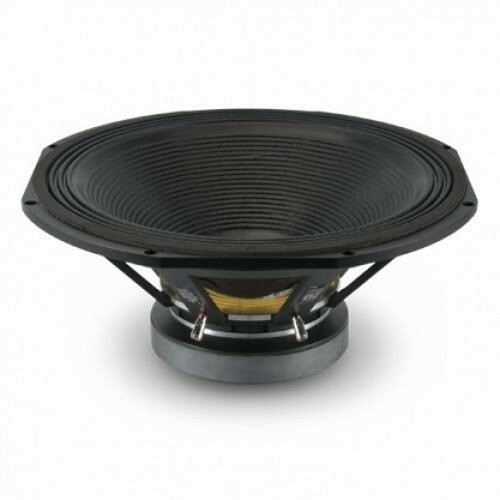 This allows the driver to combine high-sensitivity with the structural integrity required to produce undistorted low frequencies at extreme sound pressure levels. The driver handles 1200 Watts (A.E.S.) continuous and can cope with peaks in excess of 4800 Watts. This is due to advanced thermal management in the form of vented die-cast chassis and increased motor system venting. These measures effectively remove heat from the voice coil, resulting in extremely low-power compression. The Prime 18XS exhibits 100 dB sensitivity and can deliver bass down to 29 Hz (-6 dB) in a 200 litre ported enclosure. Magnetic Gap Depth: 11mm / 0.43"
Coil Winding Height: 30mm / 1.18"